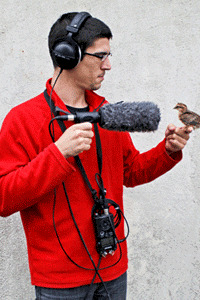 About the term "Foley" : Is the production of sounds, live or recorded, for the purpose of illustrating a film, a video game, a radio program, etc. The sounder usually works in the studio and recreates sounds from everyday objects. Some cat meows made with the mouth. Duration: 00:27. Heartbeat done with this technique cinema sound effects: www.libertivi.com/lelabodubruiteur_100. Duration: 00:32. Whoosh of a sword or an arrow through the air. Learn how to make this sound effects: www.libertivi.com/lelabodubruiteur_116. Duration: 00:12. Whoosh of a sword that cuts through the air. Learn how to make this sound effects: www.libertivi.com/lelabodubruiteur_116. Duration: 00:10. Bones cracking noises made ​​with a sprig of celery. The technical www.libertivi.com/lelabodubruiteur_123. Duration: 00:38. Tombstone that opens by sliding. Learn to make this sound effects: www.libertivi.com/lelabodubruiteur_120. Duration: 00:23. 17 screeching tire. Turn in a parking or little slippage. Duration: 00:30. Broken glass. Foley made with this technique cinema sound effects: www.libertivi.com/lelabodubruiteur_135. Duration: 00:08. 6 punches made with a technique of sound effects used in the film : www.libertivi.com/lelabodubruiteur_141. Duration: 00:05. Several farts imitated with the technique of hands under an armpit. Duration: 00:19. Noise of a rope. An arc or hanged. Duration: 00:29.